Huh, time has been flying! I can't understand it's so long since I last updated the blog! But it have been so busy months that I haven't even picked up the needles many times. I started a pair of socks, with the intention to give them to my mother as birthday present. 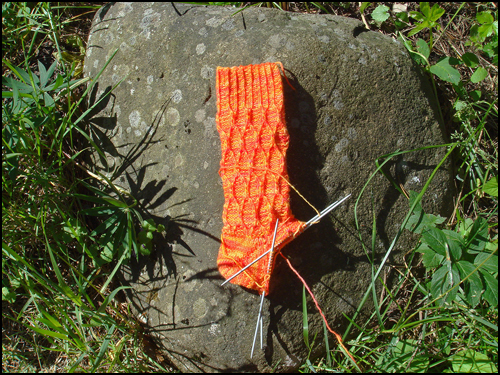 I managed to finish the first sock in May, but since Mum's birthday is on May 28th, I had to come up with something else for that, and the second sock is still not even started. 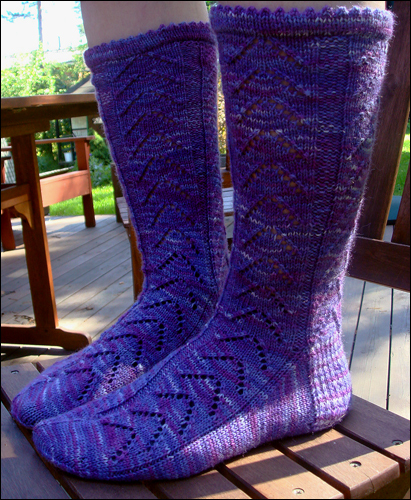 The pattern is Latvian socks by Nancy Bush from Folk socks, and they are knitted on 2 mm dpns in a yarn by Villamokka called Mokkasukka in the colourway Iris. 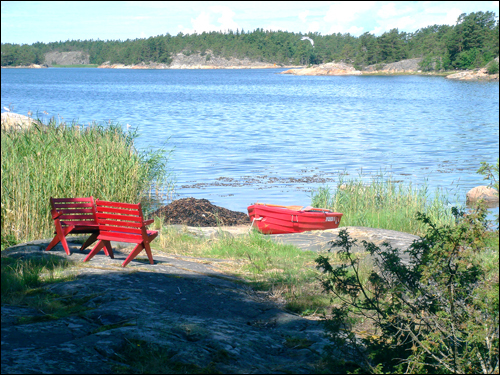 The yarn is a German Zitron yarn that is handpainted by Villamokka in Hämeenlinna. The second Latvian sock has been suffering from the second sock syndrome, and when I finally had more time to think about knitting, I decided that instead of casting on for sock number 2 I would start a new sock. One reason was the weather, we have had a lot of rain, and the yarn I chose is the perfect antidote for rain: an other Mokkasukka yarn, this time in the colourway Viimeinen kejasari, Finnish for The Last Emperor. My girls are fighting over this yarn, but I think the younger one will end up as winner, the Snicket sock will be too small for her sister. 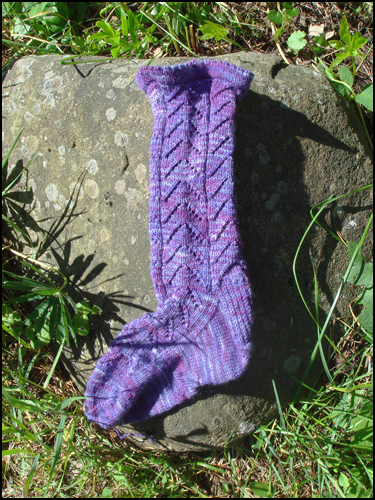 The pattern is the Snicket sock, a design by Sabine Riefler, previously published in MagKnits, but now available as free pattern in Ravelry. I'm knitting size one with 54 stitches on 2,5 mm dpns. And the heel. As you know I'm not a fan of short row heels. All ways now and then I test a new way to knit them, but so far, I haven't found a winner. But this heel is almost perfect, and I think the second sock will be even better, since now I really know what I'm doing. The stitches continue over the heel in a column not broken by the direction change of the heel, simply beautiful. Here is a close up of the heel. And do not feel sorry over my older daughter, I bought two skeins of this beautiful yarn, she will get a pair of her own, but in an other pattern. I also bought two skeins of a blueish colourway, perfect for my boys. Or for Marina Piccola by Kate Gilberts, a design that reminds me so much of Italy that I'll knit it, sooner or later. 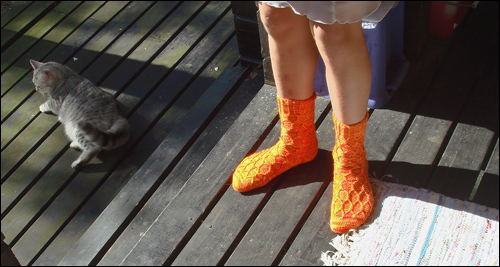 And while knitting these socks I dream of what to knit next. I long for a sweater project, but not a multicolour one, perhaps even something as opposite as charcoal or black... I absolutely need something in those colours. I love the colour of the socks I'm knitting right now, but for myself I feel for something more simple and serene.